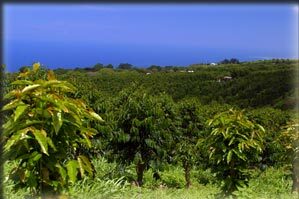 Home / Information / Learn More about Kona Coffee Family Farms! In the French winemaking tradition, there’s a word for what the Kona region is: Terroir. Kona is the unique synergy of of climate, temperature and soil. Together these qualities make a crop — like coffee — truly exceptional and unlike anything to be found anywhere else in the world. In 1828, Samuel Reverend Ruggles brought coffee to the Kona District. His cuttings originated from trees in Brazil. Kona coffee grown on large plantations did not become a cash crop until the late 19th century. Subsequently a crash in the price of coffee in 1899 forced the plantation owners to sell. Their workers, many of them Japan, bought up what would be today’s smaller family farms. Filipinos and mainland Americans also bought up parts of the larger plantations. The coffee farms in Kona are mostly family operated, and no where near the size of the plantations that formerly dominated the coffee industry. About 600 farms made up a total acreage of 2,290 acres in 1997; these farms produced about 2 million pounds of coffee per year. At the present time it is estimated there are 3500 acres producing 3.8 million pounds per year. In the months of August to January, harvesting the beans takes place. Handpicked during these months ensure the beans are picked at peak maturity. The processing of red coffee cherries by pulping and fermenting them requires lots of fresh water and time. The drying process takes time as well. The sun typically dries the precious beans. Consistent raking by hand ensures uniform drying. Consequently the end result is magic — pure, 100 percent Kona Coffee! Previous post: Kona – The perfect growing environment for coffee. Next post: Health benefits of drinking coffee!